South Korean tech giant Samsung had recently unveiled the Burgundy Red variant of the Galaxy S8 in India. 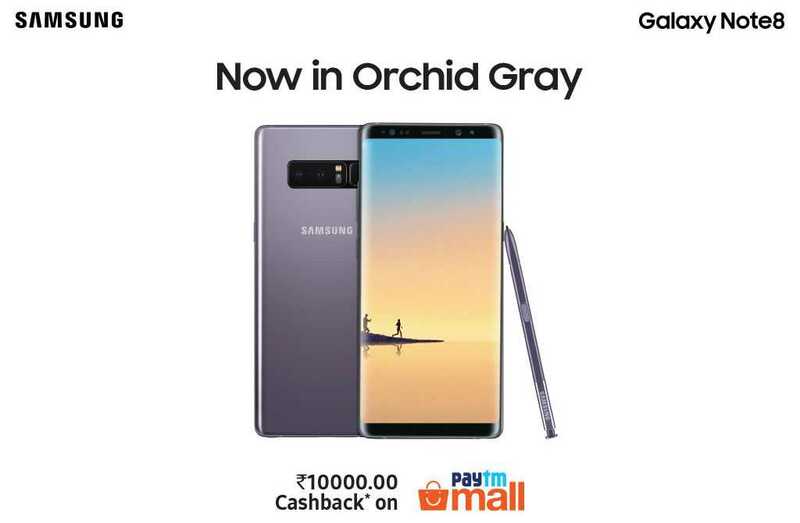 Now, the company has launched new colour variant, Orchid Gray, of its flagship Galaxy Note 8 in India. The new variant will come with a price tag of Rs. 67,900. Paytm users can get the device at an effective price of Rs. 57,900 as the they will get Rs. 10,000 as cashback. The phone was launched in September 2018 with two colour options- Midnight Black and Maple Gold. The new colour variant will be available for sale from April 17 across online and offline retail channels. Galaxy Note8’s stunning Infinity Display, enhanced S Pen and true Dual Camera wowed consumers across the country. The classy and suave Orchid Gray colour will give consumers another great reason to buy Galaxy Note8 and express their own personal style,” said Mr. Aditya Babbar, General Manager, Mobile Business of Samsung India, in the press release. Adding a new colour variant to the existing product in order to revive the sales seems to be the trend amongst smartphone manufacturers. Apple also recently launched PRODUCT(RED) edition of its iPhone 8 and iPhone 8 Plus. As mentioned earlier, Samsung added Burgundy red colour to its Galaxy S8 smartphone. The new variant only comes with different colour but the specifications remain the same. For those who are unaware, here’s a quick recap of Galaxy Note 8 specifications. The phone sports a 6.3-inch Super AMOLED HD+ Infinity display with resolution of 2960 x 1440 pixels and aspect ratio of 18.5:9. The display features dual curved edges and Corning Gorilla Glass 5 protection. It is powered by Samsung’s own Exynos 8895 octa-core SoC clocked at 2.3 Ghz coupled with 6GB RAM and 64GB internal storage which can be expanded up to 256GB via microSD card. The device was launched with Android Nougat but Samsung has started rolling out Android 8.0 Oreo update. In terms of optics, there’s dual camera setup (12MP + 12MP) with Dual LED flash, OIS, 2x Optical Zoom, 10x Digital zoom and f/1.7 aperture. The phone also supports 2x optical zoom. There’s an 8MP selfie camera at the front. The battery capacity of the device is 3300mAh. One of the key highlights of the phone is the S Pen, which is a stylus that enhances writing and other functions on the phone.